Symphony Space’s annual literary rite of spring celebrating life, love, and language in James Joyce’s lavish, languid, and lively prose. Led by terrific actors and avid Joyceans including Lisa Flanagan and Malachy McCourt. 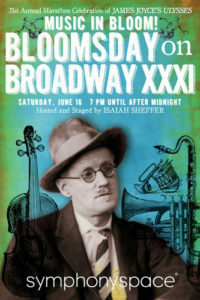 This year’s event features a whirlwind tour through the episodes of Ulysses; a reading from the breathtaking Molly soliloquy by Terry Donnelly; as well as a section dedicated to W.B. Yeats in honor of the 150th anniversary of his birth, led by New Yorker poetry editor Paul Muldoon and featuring Colum McCann and Gabriel Byrne; and a special recreation of a BBC radio play interviewing Joyce’s friends and family directed by Neil Hickey. Hosted by Belinda McKeon. Bloomsday on Broadway is held in partnership with Irish Arts Center.